Ok, this con is so short and I will have virtually no time to draw sketches because this is my first trip to London and I'm not going to be sitting in my hotel room sketching while I should be out on a double decker bus - but I know a lot of you want to get on my sketch list so I am taking a pre-convention sketch list for the first time. 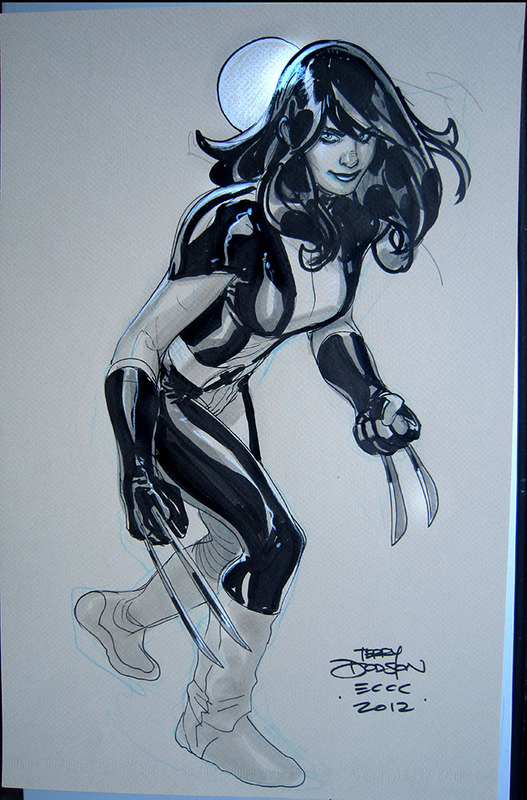 a) be able to pick up the sketch at the Kapow Con May 19-20 in London, England in PERSON! As it will be very difficult to take a list and do the sketches at the show, I'm going to take a list of pre-show sketches online. I will do as many as I can and I will notify you by email if you have been selected. After I inform via email that you have been selected - to reserve sketch, pay 1/2 up front via Paypal and the rest in person when you pick up sketch. You can pay the full amount up front via Paypal if you want. These sketches will be done before and during the show, not after. -Can be done on White Strathmore Bristol Board instead of colored for same price but let me know NOW! You must pick up IN PERSON at the Kapow! Comic Convention in London May 19-20. 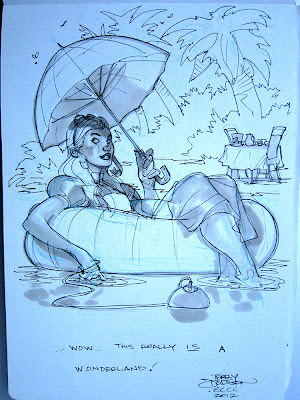 If you don't pickup in person I'm will sell the sketch as I will not be mailing art or making any other arrangements. These are CONVENTION sketches not commissions and will treated and executed like my traditional convention sketches and there are plenty examples of sketches online so there shouldn't be any surprises. No returns, refunds, hassles, etc. I'm just trying to get sketches to those of you who want sketches and can't make it to shows in the US! Hopefully that is everything! This is my first time doing a pre-convention list - I will do my best to deal with your request. If not, know I tried :-) I reserve the right to make changes and extra REASONABLE requests to this list, if I happen to remember later, but for the benefit of all! And the other Black Cat from the March 2012 show in Seattle. Drawn on 11 x 17 Canson Pastel Paper with Col Erase Light Blue Pencil, HB Lead Pencil, Pitt and Copic Pens, Warm Grey Copic Markers and Prismacolor Pencils. Here's X23 from the March 2012 show in Seattle. 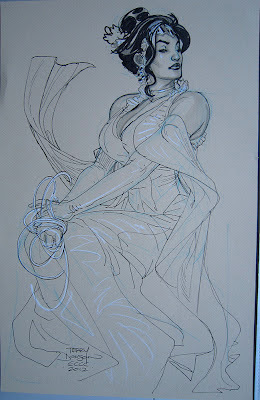 Here's Wonder Woman from the March 2012 show in Seattle. 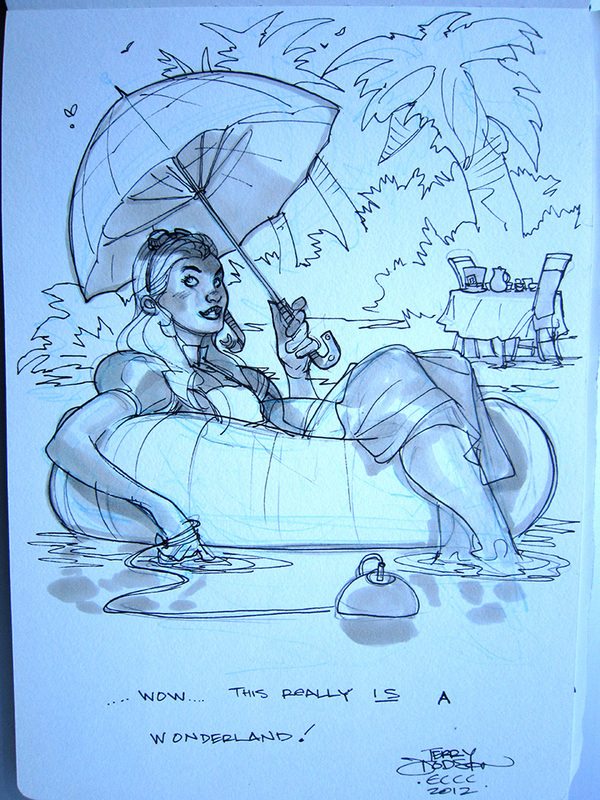 Here's the next commission sketch from Emerald City Comicon, Seattle, March 31, 2012 featuring Alice in Wonderland, but re-interpreted by myself specifically for the fan who was from Hawaii, a real "wonderland"! Drawn in a 9 x 12 sketchbook with Col Erase Light Blue Pencil, HB Lead Pencil, Pitt and Copic Pens, Warm Grey Copic Markers and Prismacolor Pencils. First one from the show, Black Cat, a good one to warm up on! A little post con wrap. from you table that is). It's funny how big cosplay trend has become - Saturday in Seattle felt and looked like Saturday in San Diego - crazy! solve shipping problems, available online as well. the hotel room. I'm starting to post them here .... now!